Phantasmat: Déjà Vu Collector's Edition is rated 3.0 out of 5 by 42. Rated 4 out of 5 by Zurreen from A Good Game Overall This was certainly a much better Phantasmat game than the last few EIPIX has made. The main idea was not exactly original, but the game did have an original "twist" on it. The story was interesting, even though it digresses from the opening, which is recaptured only in the Bonus Chapter. So that was a rather annoying and pretty long "diversion." The other thing that bothered me was the hypnosis. I know, I know. They did mention in a message (if you are quick enough to read the whole thing! ), at the very beginning of the game, that the hypnosis methods, etc., in the game had nothing to do with the way it is done in real life. Still, the hypnotist does not even snap a finger and the subject goes under, at the very beginning of the game. Even a magician needs to do more than that. So that was quite disconcerting. You have to make the story a little believable in order for the gamers to really "get into it"; and starting the very game with something so unbelievable is really starting off on the wrong foot. But if you can suspend your disbelief in this respect, as well as ignore the fact that the story has taken a completely different turn from what the opening had led you to believe it would be about, then the game becomes rather interesting. The HOPs and puzzles were pretty good, and not hard at all. The one thing I do like about EIPIX games is that you can always get just about any achievement even after finishing both the main game and the bonus chapter. [The only thing you cannot get, of course, is the achievement for finishing a HOP scene using only Match 3.] So I do like that flexibility, because you can then actually focus on the *game* rather than on irrelevant things like morphing objects or collectibles, both of which are present in this game, as is apparently a "requirement" these days for making a Collector's Edition. In short, except for the somewhat misleading opening and the rather unbelievable methods of hypnosis, this was a pretty good game that I think most gamers will like. Rated 4 out of 5 by cathybobcat from UNIQUE IN ITS OWN WAY Did the demo for the SE and also the CE and decided to go for the CE. I don't really like to compare games because they all have differences in their own way. This is in a class by itself, adding much to the imagination if one is open to it. I thought the story was far out and convoluted, but that's part of what distinguishes it. It is the gameplay that matters to me more than the story and I liked the way this game flowed, as well as the challenge factor....not too easy....not too hard. For the most part, it held my interest until the end of the game, including the Bonus Chapter. The graphics are atmospheric and typical of this series, adding to its eeriness and mystery. Even though dark and foggy, they were excellent. I became immersed in it. There is a fair amount of a variety of HOS which I really enjoyed. Effort went into some of these both in artistry and challenge. I would have liked more of them. There are more puzzles than HOS, but it was in balance with the rest of the game. Some of them I liked and some I skipped. One thing I never like with many puzzles is when they are very time consuming (pain in the brain), which can make a game appear longer than it really is. I don't care to be spending too much of game time with puzzles, anyway. You can replay 19 HOS and 21 puzzles....and some of these, I feel are replay worthy. You collect 36 brains in a jar...humorous. There are 16 morphs to collect...and there was a morph hos in the main game that was different, not taking up too much time. I never care for waiting around forever for something to morph. The bonus chapter was short, but enjoyable. It is not necessary to the main game, which I thought ended abruptly, but either version of this is fine and stands on its own. I liked having the extra gameplay and don't buy too many CE's. With the addition of the SG, as well as the additional extras, I am pleased to have the CE version and think it is worth it. Rated 4 out of 5 by Ironic_Twist from Not a bad instalment I've played all the Phantasmat games. This one is typical of the series, with a creepy storyline, HO games, puzzles, etc. No issues with game play. Four stars instead of five because it was very short. Even with playing the bonus chapter I was done in about five hours. Rated 4 out of 5 by brigluan from Attention grabber This game got my attention right away even though it is like a lot of the other games that have come out the last few years. The demo at least held my interest enough that I will definitely purchase. I dont understand all the bad reviews and low rating, yes, it is almost cookie cutter, however most of the h.o. games of the last few years have been and got much higher ratings, unsure what makes it worse. Rated 4 out of 5 by Innerl from Game gets better as you progress past the first part I see a lot of reviewers are giving the game negative reviews based on the demo. While I agree the first part of the game was "odd" and a bit disjointed, the game gets much better as you progress. And the bonus game is quite intriguing. Rated 4 out of 5 by firekat7 from Good Addition to the Series This wasn't the top game in the series, but I like it more than the last one, and it certainly doesn't belong towards the bottom of the list. I found the story line and game play fun enough to play the main game in one sitting. My favorite location is the store. There's some funny stuff in there. My only complaint is with some of the Eipix standard puzzles. I find those climbing "puzzles" inordinately annoying. I also find the puzzles with maps in which you avoid your adversaries very annoying as well. Rated 3 out of 5 by zuliker from Not the best in the series. The story is eh, compared to other games in the series. The hidden object scenes are OK except for the little game versions where you're supposed to find the objects the narrator is specifying while giving a story. Those are extremely obvious as their graphics are very different that the background objects on the screen, making them really stand out. Not very challenging at all. The "find the difference" scene requires zero thought whatsoever because the cursor automatically changes to a hand icon when you hover over one of the correct answers so all you need to do is just move the mouse around until the cursor changes, and this is all while playing on the "hard" mode. A good game to use a free game pass on but I can't really find justification for paying full price for it. Rated 3 out of 5 by winterstorms from Phantasmat??? Really????? I have the entire phantasmat series and almost think this is a different franchise with the wrong title. It is not the old style creepy game I know and love. The play was clunky and while the video quality was good it was like poorly managed puppets. It might just be my age but I had trouble concentrating on the "story" line. I do not recommend this game. If this is the best they can do, Please stop the Phantasmat franchise now. Rated 3 out of 5 by krinneyd from Dark & Dreary.... and what was with that cut out pasted head? This game was certainly better than some of Eipix games I have played. I found the puzzles extremely difficult and far too long some of them. Great for those who are expert gamers - clearly I am not. The graphics got ridiculous with the pasted cut out head on the woman in the trailer......really? so cheesy and sloppy. Maybe it was meant for comic relief in a game filled with tension.....fail, it just really annoyed me. I know quite a bit about hypnosis and you can't make anyone do something that is against their morals or ethics - but then some of us do have some pretty loose morals and ethics. Ordering someone to kill them self tho is especially difficult, our survival instincts kick in on that one. Lizard brain is still very much alive in most everyone. However, the brain can be tricked into doing just about anything. I was really disappointed that there was no 'shut the achievements off' button - I really dislike those popups. I don't care how fast or how better or how short or how long or how anything I did was - ever. please bring it back. A great game for those who like this kind of thing and difficult to solve or long drawn out puzzles. Rated 3 out of 5 by CLUELESS35861 from little imagination on eipix part, same old psychotic psychiatrist eipix needs to dial down some of the sensitivity on the non hop games; aligning the bars, dialing the combination lock took away from the gameplay. storyline same old eipix treatment of phantasmat, the first phantasmat was the best, the repeated theme is dying with each new psychotic medical professional. Rated 3 out of 5 by rainworm from Chaos Therapy After an accident, in which your parents were killed but your sister Faith survived, she is traumatized and suffers from nightmares. You believe, a hypnosis therapy could help her, so you two seek the well know specialist in Louisiana, Dr. Ryan. We play as brother Matthew, who accompanies Faith to the hypnosis therapist. He asks us in and starts a first session with both of us,as he postulated, this would help our sister to easier access her memories. This is, what we remember, when we wake up, as if from a dream, and are alone in the therapist’s house. It has changed in a strange way, your surroundings are more surreal now, Faith as well as the doctor are gone. In the surrealistic surroundings the next scenes, consisting of puzzles and HOS suit well, but even after the third door, only hints at a tragedy in the doctor’s life are given and we go on, tapping through a maze. This way the demo ends. Again the game is well made concerning visuals, effects and other features. One thing is missing, at least for me: a conclusive story. We jump into a plot of searching for our sister in a chaotic world of a house, no hint is given as to: when will we find her? Is the therapist a criminal? Or whatever. May be after the demo a story waits, though I don’t know. So try it and see for yourselves. Rated 2 out of 5 by simplicity19 from Deleted before finishing I rarely write reviews and I never do not complete a game! That being said, this one I deleted. It was the one of the poorest games I have ever played, The story, following the steps to advance. Very frustrating. Should have listened to the initial reviews. UGH! Rated 2 out of 5 by photogirl08 from Not the Phantasmat of before I own all of the Phantasmat games and really enjoy playing them, mostly the first one. This game was really awful. I could barely make it through. Boring story line. 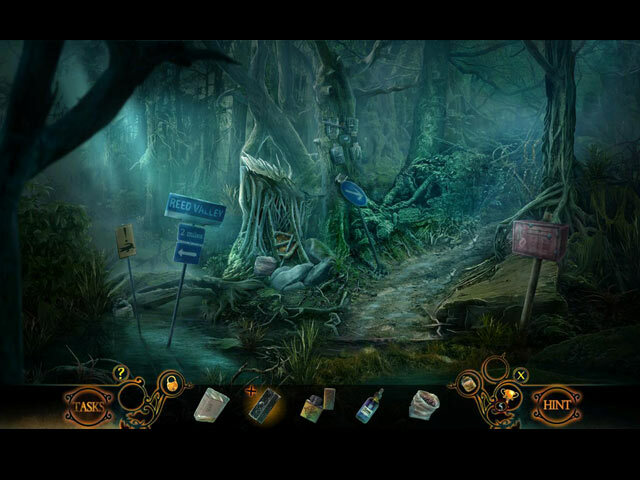 The hidden object scenes were fairly simple. Will the developers please go back to the very first game and play that one and start over on any further ideas for more Phantasmat games. Rated 2 out of 5 by Majestyx12 from I Bought it and finished it I thought this game went down hill after I bought it. In the trial part I liked a whole lot of it. The creepy doll puzzle. The mystery, helping and saving my loved one aspect, wanting justice. That's why I bought it. It has a lot of hops,19 in the main game and 5 in the bonus. What I didn't like about the hops were they became so dark it was like finding things on a black background. I had my monitor on 100% Brightness and 100% Contrast and I still had a hard time seeing anything. Normally I'm a hops lover but I hate cluttered hops and one's too difficult to find, as that isn't fun. I did like the bug one. The morph one's especially the one in the bonus chapter was way too slow morphing where you had to wait and wait. I liked very few puzzles, only like the doll puzzle and I liked the finger prints on the window one which I didn't need them to hold up for me. I kept trying the mole puzzle but I couldn't figure it out even with the guide. Most puzzle further in the game showed you what they did and I didn't care about these. I wanted to see how they did the mole puzzles and it didn't show it. They had some puzzles you couldn't skip and it was a pain hinting your way through it. It got to where I rode that hint button all the way to the end of the bonus chapter. After I was done I went to the replay of the puzzles and tried doing the mole puzzle again, No luck. I was very disappointed. I own all of the one's in this series with my favorite being Behind the Mask. This maker usually has morphs in the hops but they didn't in this game, I think they should have. I did like the 16 morphing statues in some scenes. The indicator took me a while to figure out as it stayed on during some puzzles and that is unusual. You collect 36 hidden brains in a jar and the last scene in the main game wouldn't let you get it. It had dialog and ended after the dialog and I was clicking that jar and it wouldn't pick up. It's a good thing this maker kept that perk they alway have, which is you can retrive your collectibles that you miss after the bonus chapter. You have 15 souvenirs but would have been better with normal lighting. If they don't listen to this buyer, this will be the last one I buy in this series. Rated 2 out of 5 by ljmb21 from Sorry ....Awful! I am usually a fan of the phantasmat series, this one is just awful! Rated 2 out of 5 by LunaNik from What just happened?! I'm a diehard horror fan, whether it's a game, a book, or a movie. Eipix did such a shudderingly good job with Mournful Loch's story, gameplay, and production that I expected brilliance in this episode. What I got instead was a patchwork story with sparse gameplay, and gratuitous jump scares and gross outs that weren't relevant to the storyline. Horror doesn't mean "shoehorn in every single horror cliché you can think of." The best horror (think Hitchcock) turns the mundane into hair-raising, spine-tingling, skin-crawling fright. Real horror gives you nightmares; it doesn't make you roll your eyes. Since when does hypnotic regression therapy induce hallucinatory insanity? I mean, were those sugar cubes soaked in lysergic acid and absinthe? Many of us have asked repeatedly for more challenging gameplay. Perhaps we should have defined what we meant. Challenging doesn't mean connect-the-dots with no instructions; it means a puzzle that requires the gamer to actually think and strategize. Some reviewers said this game gets better after the demo, and perhaps it does. If so, the demo should have been used to grab my attention and hold it, providing me with incentive to purchase it. The demo is your advertisement and the sole thing by which we can judge the game. It seems counterproductive to waste it. Rated 2 out of 5 by Granny_Gruff from Nope, nada, never. This is not the Phantasmat we loved. That is not surprising as the series has had a few misses in the past and we were due for another. When Phantasmat is good, it is very good. When it is bad, it is awful! Matt has journeyed with his traumatized sister, Faith, to Louisiana to find a recommended hypnotherapist so Faith can try a new therapy. And at this point the story is lost in a wave of silly/ominous/disjointed bits and pieces that really add nothing to what you know and presumably want to hint at whatever the Devs don't want to tell players. Even the HOPs seemed "off." Any time a reviewer mentions weak game elements and shrugs off their failings as "the norm for this dev lately," I cringe. We will get the games we pay for, so we need to let the Devs know when they are churning out losers. I can only suggest that you play the Demo, read the reviews, and decide for yourself whether this is a game for your own collection. I felt it was a miss for me. Maybe the next Phantasmat will be better. Rated 2 out of 5 by jennsmom from First Non Purchase of Phantasmat I know the story line has been done before, but I still thought it was interesting. The beginning was fine, even with the rather silly map "puzzle," and the idea that someone would think they couldn't find their way anywhere without a GPS. Faith should be in good hands, since people seem to like the doctor, but things go downhill immediately, and without logic or reason. Suddenly, without being hypnotized, I (her brother) am hypnotized and in some dream world where I am faced with a puzzle of dolls' heads and floating eyes. There was absolutely nothing to draw me further into this game. I have all the Phantasmat games and while some are much better than others (first being the greatest), they've all been worth playing. This one, for me, isn't even worth finishing the demo. Rated 2 out of 5 by sunnyglow from LET’S “DRAIN THE SWAMP” OF BORING GAMES - THIS ONE WOULD BE A GOOD START REVIEW BASED UPON THE ENTIRE GAME 4 Chapters Plus a Bonus Chapter – Strategy Guide: 43 Pages OVERVIEW: Welcome to Louisiana! In this land of swamps and bayous, you, Matthew Rust, are off to save your sister, Faith. Anguished by the death of your parents in a car crash, she is now suffering from terrifying nightmares of the accident. Dr. Zachary Ryan is her last hope! His hypnosis techniques are controversial; however, this may be your last chance to save her sanity. Nevertheless, something is not quite right with this doctor and unfortunately, you and your sister will find out the motive behind his bizarre treatments. The doctor is stuck in his own nightmare, anguished by of the loss of his wife, Melissa. Join your sister in her nightmare, assess what the doctor is planning, and then try to save your sister and yourself from his grip. OPINION – WHAT HAS HAPPENED TO EIPIX? BUYER’S REMORSE! I purchased this game and regretted it. This game may appeal to those who like this series. However, for me, it cannot compare to the previous games in the series. For me, it is more boring than scary. The game is somewhat slow-paced driven by all the psycho-babble and lack of activities. Although it is meant to be a psychological thriller it became a boring journey into a dream world with little activity except back-and-forth searching for items and playing numerous non-creative HOP scenes. There is about as much movement in this game as a hot day in July under the summer Louisiana sun. The graphics, although a little stereotypical of Louisiana, provide a somewhat spooky image of the swamp-like bayous. This is one game where I kept looking at my watch to assess how much longer it would take to finish it and bury it in the swamp! I should have been paid to play this game! What has happened to EIPIX? At one time the best developer on this site, nowadays it is a toss-up as to the quality of any game they produce. BONUS CHAPTER: It is a sequel. This time you play Faith. Dr. Ryan’s wife, Melissa, helps you remove the memories of the car crash. You will need to revisit the tragic scene and try to release all your repressed emotions of sadness involved with this crash and death of your parents. The chapter is long, and I feel worth the extra money if you like this game. I found the puzzles better designed in this chapter than in the main game. On the other hand, I found the HOP scenes as boring ones as the ones in the main game. MECHANICS: There are the usual four levels of play including a customized version. There are fifteen (15) achievements. Collect thirty-six (36) brains and sixteen (16) morphing objects. At the end of the game you collect fifteen (15) souvenirs, (moths), for the Souvenir Room moth collection. Some of the collectibles are easy to locate but others are not. You can replay nineteen (19) HOP scenes and twenty-one (21) puzzles. There are eight (8) wallpapers along with the usual concept art, music and video sequences. HOP SCENES: Boring! Let us add “super” to make that “super-boring.” There are twenty-one (21) in the game. There are also some mini-HOP scenes as well. There are too many in this game and they show little creativity. Most are lists of items with little interaction with the scene. I got tired of looking for items in junk piles. However, there are a few which are decent. 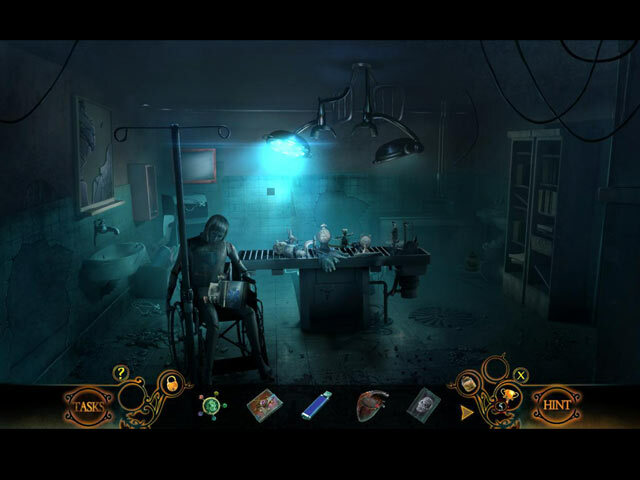 EIPIX provides several scenes in which the player searches for morphing objects. There are also a couple of scenes with rebus clues. There are some multiple step ones as well which include silhouette items. Of course, it would not be an EPIX game without their standard, now hackneyed, scene. Don’t remember it? Search for five items, which, when placed into the scene, produce two lists of items to locate. You have the option to play a Match-3 game in lieu of the scene. PUZZLES: There are thirty-eight (38) puzzles within the game. Some of the puzzles are creatively designed and some are not. There are some which are just idiotic. Among all the BFG developers, EIPIX used to provide the best puzzles within their games. However, I do believe, those bygone days are gone. Now, they are creating some rather bizarre ones. There is one puzzle with flowers in which you must click on a green section of a circle every time you see the outline of the flower. This puzzle appears four times within the game. Why? It is not tied to any gimmick, so why would this developer provide four variations of it? 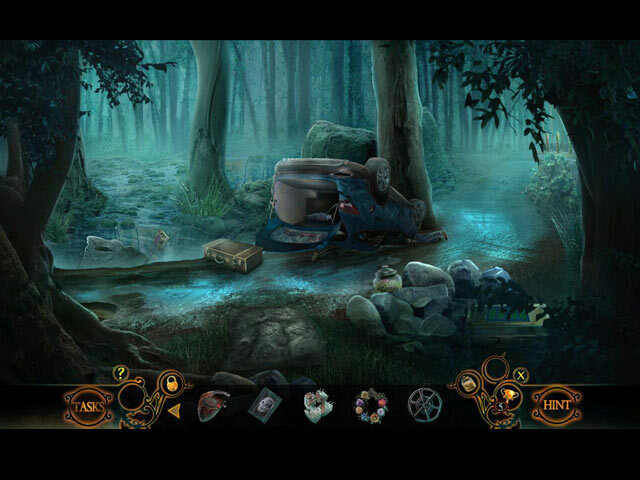 The puzzles are varied in style and difficulty. However, most are easy. I found the puzzles in the bonus chapter the best ones in the game. EIPIX did provide one puzzle in which you have the choice between “hard” and “easy” options. I wish they provided more of these. And once again, a couple of puzzles had CONFUSING AND NONEXPLICIT DIRECTIONS. SPOILERS: HERE A FEW PUZZLES AFTER THE DEMO: A. Map puzzle. Move your token to avoid police, which are in the streets with flashlights. If you are spotted by the police, you must start over. You have options for the paths you take. 3X B. Whack-a-mole puzzle. Whack a mole as quickly as possible to reach a high score. Really? C. Assembly puzzle. On a grid, place eight (8) plates over holes so that all holes are covered, and all plates are used. You can overlap the plates (which was not indicated in the puzzle directions) D. Mathematical puzzle. Using arrows which move an indicator either two spaces forward or three spaces backward, center an indicator on two specified locations. BONUS CHAPTER PUZZLES: E. Assembly. Switch on-and-off the lights on a digital readout to create letters to form a name. F. Assembly puzzle. On a grid of nine (9) spaces, place six slats onto this grid so that nine fans appear with four blades each. G. Assembly puzzle. Assemble a skeleton by placing arrows in correct position to move its parts to their proper location on the trunk of the skeleton. You must strategize where to place the pieces because you cannot test their placement until the end. H. Slider puzzle. Slide chains of beads on a bracelet to move a skull from one end of the bracelet to the other. Rated 1 out of 5 by tesamoine from The worst Phantasmat so far This series has steadily been going downhill. This one took the plunge right off the cliff. Storyline was absolutely ridiculous and impossible to follow. Mini games were either super easy or I could not figure out what they wanted at all. The game was very very short. If I could give this a 0 I would. Rated 1 out of 5 by puppynurse from What happened to Phantasmat I am so glad I only opted to play the demo of this dreadful game. The mini games had virtually no instructions. The hidden object scenes were terrible. Nothing made any sense. I did not even finish the demo before unistalling this joke of a game. I love the first phantasmat and have played it over several times. Stop churning out games that are garbage and give us something worth downloading. Rated 1 out of 5 by fiewi1 from Nock-nock... who's there? I mean... for me, this one was a total disappointment and this is why I stopped playing even the demo. Rated 1 out of 5 by snowbunny1977 from Hard Pass! I've played a couple of these games before and liked them. This was terrible. The puzzles although challenging were confusing and not very clear sometimes. They got to the point of tedious and I didnt bother and skipped them. The story just wasnt all that great. I love weird games and this just was weirder than usual lol. Its more of a confusing weird which isnt what you want. I didnt even bother playing the bonus. I was done and its a shame I wasted money even if it was 60% off at the time. Its not worth it and yes I played the demo and thats probably the best part of the game and how they sucker you. Dont recommend because its just not fun! Rated 1 out of 5 by guppylove56 from Where Are The Extraordinary Games Lately? In my opinion, there's nothing worse than having to constantly talk to characters in a game. I'll uninstall a demo extremely fast, when and if I realize the game has a lot of irritating chit chat, speech bubbles, phone calls, interacting conversations where you choose the answer, etc. I want to seek, search, solve puzzles and mix recipes. The last thing I want to do is spend game time having all kinds of ridiculous conversations with fake people in a game. I opted out less than half-way through this demo due to utter annoyance. Phantasmat in the past has been pretty good. Well, what happened? This was nothing like past Phantasmat games. In fact, this is probably the worst in the series and according to other reviews, others agree. Hard for me to believe the creators of the game, actually liked playing this one themselves. Rated 1 out of 5 by campingramps from Their kidding us, right? Deja Vu does not describe this one because I have never seen a Phantasmat like this before. I guess the developers were trying to scare us with the disclaimer at the beginning but it didn't work. Nothing to be scared of here folks just a lot of confusion trying to figure out what is supposed to be going on. The girl has the problem but the doctor says he has to hypnotize you, too, to unlock your sisters thoughts. You weren't even in the car when the accident happened. ??? I gave up fairly early on this one, 30 minutes, so maybe I missed some of the 5 star stuff. Graphics are a cross between ok and dark leaning more toward the dark side and the HOs are confusing and difficult to figure out. Evidently these developers like the find 2 similar objects HOGs. Not a fan especially when there aren't any clear instructions. Oh well, I don't recommend this game and that's a shame because some of the other Phantasmats are pretty good. Play the demo and decide for yourself. Maybe you can get farther than I did. Rated 1 out of 5 by MissAbby from What was in those Sugar Cubes?? Seriously, something was in the Sugar! I personally have been asking for more challenging games. This is not what I meant! This is utter jibber-jabber! Throwing in puzzles with no explanation of what to do, bizarre objects floating around all the while in some kind of nightmarish crazy land isn't challenging, it's just silly! Perhaps if there had been a back-story to explain the circumstances, be we are just pretty much thrown straight into trippy land Puzzles ..easy after you figure out you're in a puzzle and what is required. Hops, cluttered. Graphics are detailed and pretty, but I don't purchase games for their graphics alone. Storyline..what storyline? I will not buy this silly game.